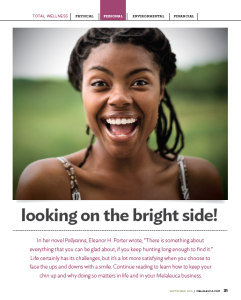 IN HER NOVEL POLLYANNA, Eleanor H. Porter wrote, “There is something about everything that you can be glad about, if you keep hunting long enough to find it.” Life certainly has its challenges, but it’s a lot more satisfying when you choose to face the ups and downs with a smile. Continue reading to learn how to keep your chin up and why doing so matters in life and in your Melaleuca business. Two salespeople were sent to an island to sell shoes. Upon arriving, the first, disappointedly sent a telegram back to the office: “Will return home tomorrow,” the salesperson wrote. “No one here wears shoes.” The second, confronted with the same scenario, joyfully telegraphed back, “Please send me 10,000 shoes. Everyone here needs them.” Both salespeople contemplated the same situation through completely different eyes. Clearly, the second was able to look on the bright side of things. He possessed a trait that, combined with hard work, always leads to growth and success: a positive attitude. But what is attitude anyway? Simply put, it’s the way you communicate your mood to others. In a deeper sense, it’s the way you see the world, or, in fact, the way you choose to see the world. Because, fortunately, having a positive attitude is a choice. Of course, no one can have a perfectly positive attitude all of the time. As things go wrong throughout your day—appointments get canceled, rejection comes your way and daily problems arise—negative thoughts start to alter your perspective. And if you continually let the negativity all around take over, you’ll find yourself developing a chronically negative attitude, which weakens the spirit, reduces energy and saps enthusiasm, for both yourself and those around you. Here’s something to keep in mind as you build your Melaleuca business: Just as a cold or flu virus can be spread to others, so can an attitude. 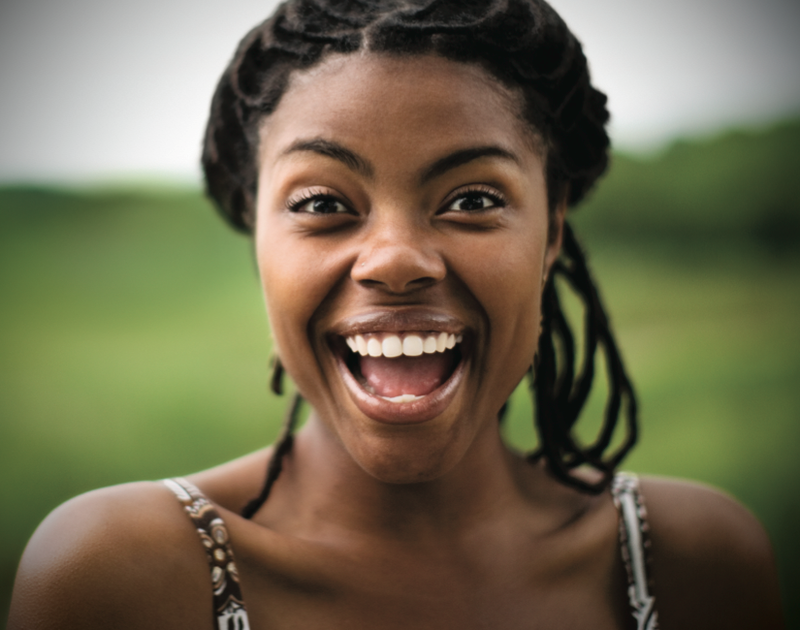 Studies have shown that moods— good or bad—are actually contagious. In one study, individuals in work teams began passing their moods to others within two hours. What’s even more fascinating about this phenomenon—known as emotional contagion—is that leaders’ moods hold particular sway over their team members. So what does this mean to a Melaleuca Marketing Executive like you? As a leader or aspiring leader in your organiza- tion, you have tremendous power to influence the performance of your team. One of the most effective ways to successfully lead your organization is to simply be positive. Before meeting with members of your team— especially when their perfor- mance improvement is the task at hand—be aware of your mood and its potential impact. You should identify the negative attitudes to which you are prone, as well as their positive counter- parts. Replace pessimism with optimism, sorrow with happiness, anger with peace, doubt with confidence and grumpiness with humor. Strive to be a mood and attitude role model in your organization. Using the principle of emotional contagion, you should seek out team members whose moods and attitudes are negative and change them through positive influence. When your team sees you react to challenges with optimism and enthusiasm, your example will inspire them to do the same. As you work to identify potential business builders in your organization, focus on those who exude positivity. Their attitudes will rub off on others to create a network of happy people. In short, think of yourself as your organization’s CHO (Chief Happiness Officer). You can draw on inspiration from other leaders you know whose positivity influences their organizations for the better. Gratitude is a virtue that helps you focus on the good things in life and see the bigger picture. When you concentrate on what matters most, your perspective widens from the tree in front of you until you see the whole forest. Even through rough times, there are many things you can be thankful for. Make it a daily habit to identify specific things you’re grateful for. Doing so will help you cultivate a positive attitude as you train your mind to focus on the good things in life. Make humor a part of your daily life. Laughter and a good sense of humor are key elements of a positive attitude; they reduce stress and anxiety, they strengthen relationships, and they elevate mood and hope. When you feel low, turn to comic strips, a funny sitcom, online jokes—whatever makes you laugh. Look on the lighter side of things in your daily activities; humor will help you keep a more optimistic view of life. Always keep a positive, inspiring book on hand. When you’re feeling down, turn to a motivational passage and give yourself a quick boost. Good books can inspire, encourage and teach you. Also, reading requires you to stay still and focus—and focusing on something uplifting will help you maintain a positive attitude. Besides providing undeniable benefits to your physical health, exercise can also make a difference for your mental health. Researchers have found that exercise combats stress and depression, and improves mood and attitude. Also, don’t overlook the connection between your self-image and a positive attitude. When you feel and look well physically, you gain confidence and see things with more optimistic eyes. It’s easier to get discouraged when you don’t know where you’re headed. Goals give you a positive direction toward growth and progress; they can provide a specific focus on what matters most and broaden your perspective. Visualize your goal and let positive thoughts fill your mind as you see yourself accomplishing it. Remember, however, that things won’t always go according to plan. One key to having a positive attitude is to understand that things will often go wrong. So, when obstacles come your way, adapt and look toward the end of the tunnel; your goals will help you focus on what’s most important. When life’s difficulties get in the way, feeling isolated or alone can easily get you down in the dumps. One of the best ways to stay happy and positive is to share your challenges with someone who truly cares about you. The empathy, support and listening ear of a family member or best friend can lift your spirits. There’s something magical about helping others in need: It causes you to forget your own problems, and your motive becomes their wellness—not your own. The next time you’re stuck in a “woe-is-me” mindset, put this principle to the test. You’ll find there’s great euphoria in doing something to bless the life of another without any thought or expectation of reward. Each day brings new chal- lenges that demand the best of you, and the way you choose to face them will determine much of your growth, success and happiness. Cultivating the gift of a positive attitude will change your perspective and help you see your goals more clearly; you’ll find added strength to reach them, and you’ll surely make life a more enjoyable ride for yourself and those around you. Remember, it’s your choice. So choose to look on the bright side. * Written in collaboration with Chris Hansen.